Life Is What Happens: Think Pink!! There was an article in the business section yesterday, which was actually "clipped" from INC magazine - (they provide the horoscopes for this site). It was about the importance of having something "flashy" in your store window or among your display samples etc...to get people excited about buying, which in our case is, yarn. The magazine gave several examples. One was Volkswagon's neon green car - tricky for a yarn store window, I agree. This is not the colour that most people buy; but it is the colour that draws people in. Another example was a shop that put a pink purse in the window. Most people did not buy the pink shade, opting for black or grey, but they did come in to see it and be amazed by the dazzling colour!! I guess that I was thinking pink last night because I cast on for Sagittarius in Fantastic Knitting Zephyr lace weight yarn - Dianthus. As I said in an earlier post, I am knitting through the signs of the Zodiac in lace. 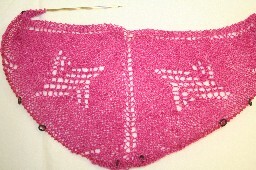 Every sign will be a top down triangular shawl in lace weight yarn. I have completed the 4 fixed signs and Sagittarius is the first of the 4 mutable signs. For the lace pattern, I have chosen a pinwheel motif, because every Sagittarian that I have ever known has been in constant motion. They are the travellers of the Zodiac. Sagittarius is also a Fire sign, hence the high colour. Dinner tonight? The lentil soup last night was excellent. I added hot pepper flakes and since soups let me clean out the fridge, I also added a bit of parsnip and I was thinking of the bok choy; but decided that it would do for another night. OK, I don't have anything pink in mind; but I do have 3 rather large beets in the fridge that need to be used up soon. Here's a recipe for Borscht. I know, it's another soup - actually this recipe reads more like a contractor's list for building a house - you will not go hungry - keep some frozen in the freezer, in case you have a Borscht attack or need to feed your inner Russian!